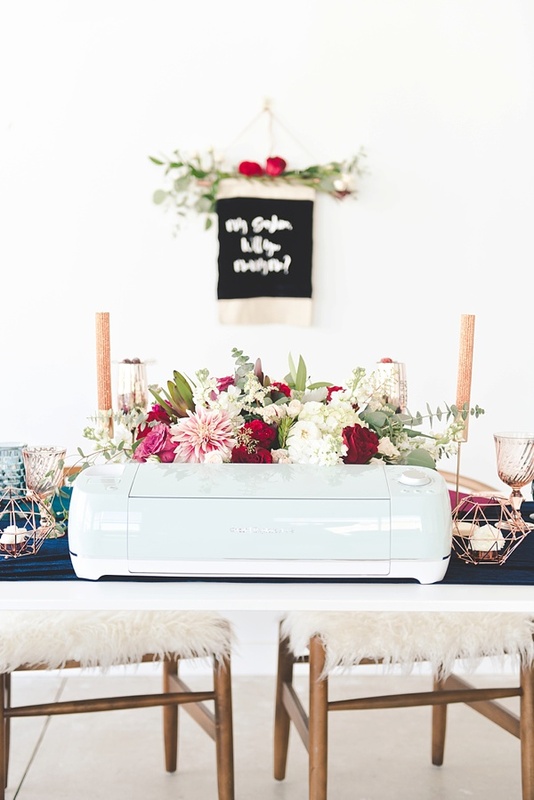 Inspired by the very beginning of a wedding journey as well as autumnal loveliness, we are so excited to share our latest DIY project created in partnership with our friends at Cricut! 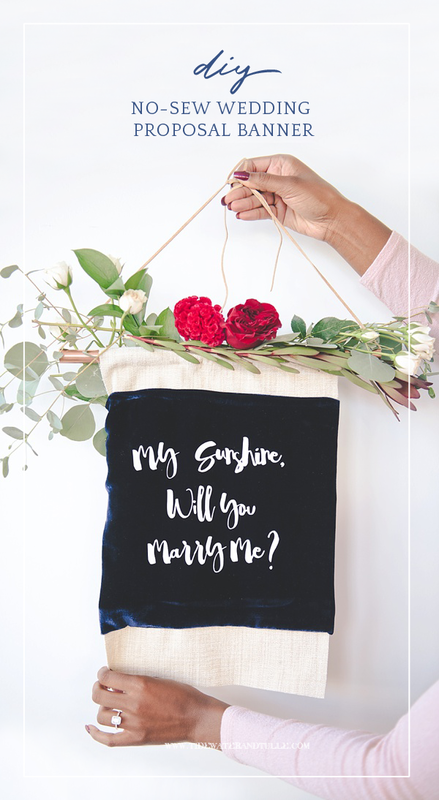 With the trendiness of velvet and personalizing details in the wedding world, we have created a sweet wedding proposal banner tutorial for any lovebird wanting to pop the question in chic memorable style! 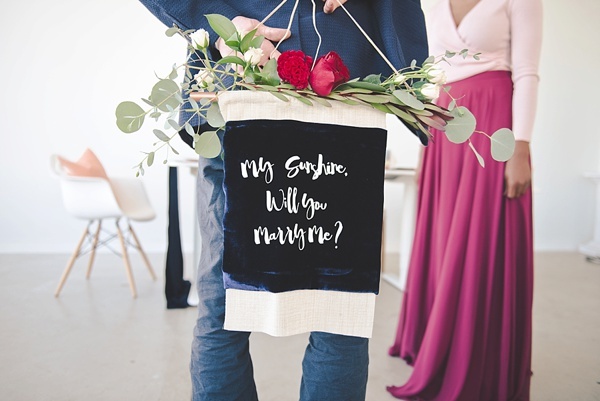 This banner can be made with your choice of colored velvet and perfected with Cricut's new EasyPress tool to make sure your iron-on words show your love as beautifully as possible. Let's get our craft on! 1. Lay out all of your materials. We'll first start with getting our iron-on message cut using our Cricut machine and Cricut Iron-On Lite material. 2. 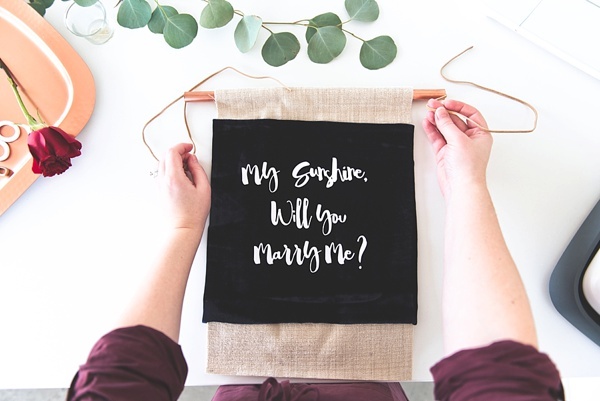 Download our MARRY ME graphic and upload into Cricut Design Space via the smartphone app or personal computer. (Of course, you can also always design your own and upload!) On your digital project canvas, size your graphic to 7" wide. 3. 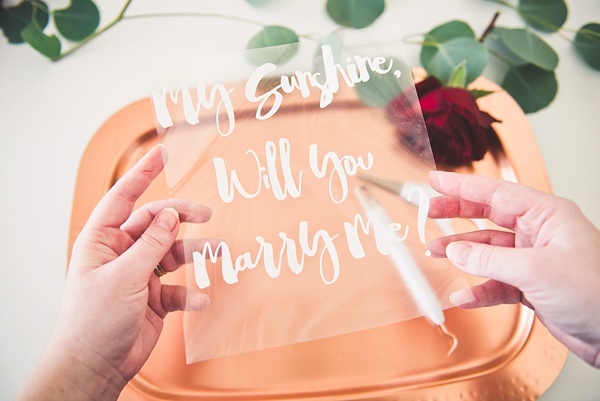 With the iron-on material shiny side down, trim down the iron-on material needed, set up your iron-on material on the adhesive grip mat, and cut out your marriage proposal design with your Cricut machine. Helpful Tip: For iron-ons, you must make sure it is a mirror image before you cut, or it will iron-on backwards on your banner! Cricut Design Space will have this option very clearly marked before cutting. 4. After you weed out the negative space on your freshly cut graphic, leaving only the words, set the graphic aside to now prep the banner. 5. Taking your primary banner material such as upholstery fabric (which provides a stiffer base and lovely texture), cut it down to a 11" x 15" rectangle. 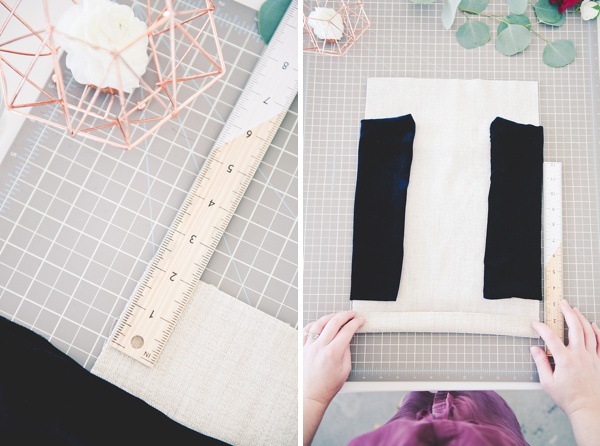 For your velvet fabric, cut that down to 12" x 15 1/2" in size. Helpful Tip: Velvet can be a temperamental fabric to work with! It requires a little extra TLC when it comes to crafting! Fuzzy bits will happen. So to cut, we found that a rotary cutter, cutting mat with a grid, and some invisible tape helped immensely when creating a straight edge. Since our particular velvet had a bit of stretch to it, we allowed an extra centimeter or two for when we finished the edge in the next step. 6. To create a finished edge on your velvet section, fold the top and bottom edges of the fabric to at least an inch or whatever is necessary to create a straight edge. With the permanent quick dry fabric glue, draw a glue line underneath the top flap you've created on the backside of the velvet. Repeat for the bottom flap. 7. 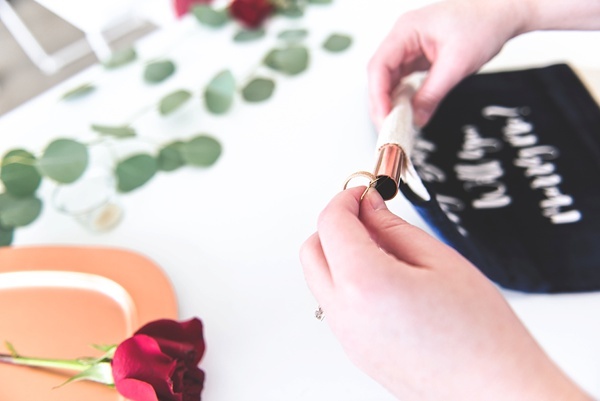 Arrange the ready-to-go velvet section on your banner leaving at least 2" of space at the top for your copper rod. Wrap your velvet's left and right edges around to the back of the upholstery fabric and glue down with the fabric glue. Be sure to also add a few dots of glue to the front of the banner underneath the velvet section as it will drape due to its weight. 8. For your copper rod, fold that 2" of banner to the backside. Before gluing down, slide your copper rod into the temporary pocket you have made to make sure you have enough space. Ideally, you'll be gluing fabric to fabric. (Didn't create enough extra space? Just glue your banner to the rod itself!) Finish the rod pocket by gluing down. Wait at least 20 minutes before sliding the copper rod through the pocket. 9. 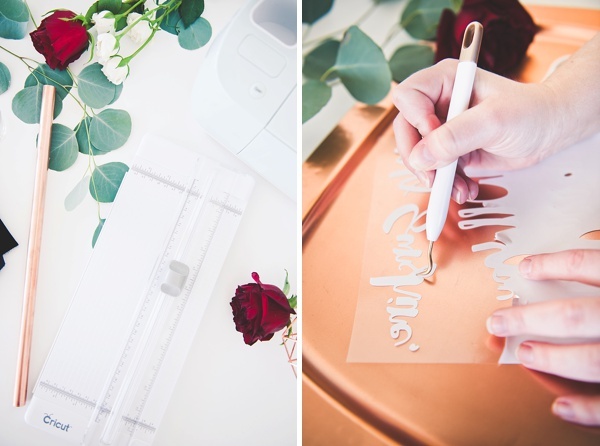 Using your Cricut EasyPress, it's time to put the graphic on your banner! Warm up your EasyPress to 270° and set the timer for 20 seconds. Place a Teflon sheet on top of the shiny side of the graphic to act as a barrier between your banner and EasyPress. 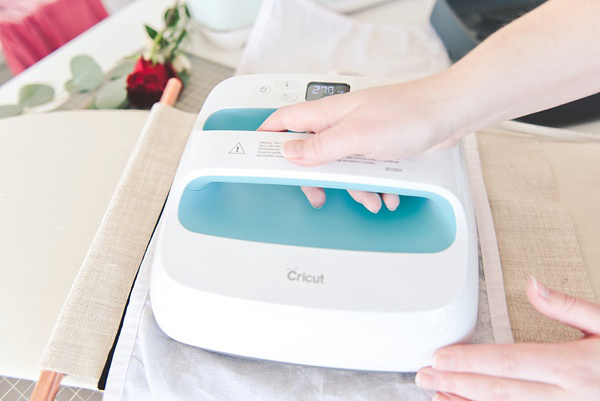 Click the glowing Cricut symbol and let the EasyPress work its magic! No need to move the EasyPress around your design as it equally distributes the same temperature throughout its entire iron plate. All velvets are not created equal! The Cricut Engineering Team is still testing out many kinds of velvets, but their current "270° for 20 sec with a Teflon sheet" is the standard for a polyester velvet. Ours was a silk/rayon blend velvet so we did play around with our EasyPress intervals with their recommendation as a starting point. We also did not have a Teflon sheet, so we used a press cloth and that contributed to needing to do a "round two" for our 20 seconds timer. Teflon definitely is preferred! 10. 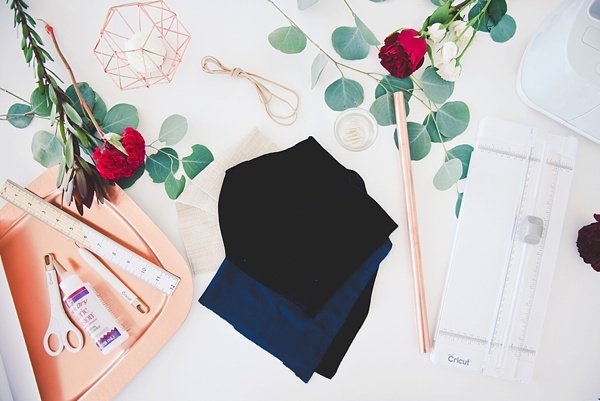 Your velvet may get some lovely shine after using the Easy Press due to its particular fibers, so balance out any heat marks and contribute a few of your own by intentionally and carefully placing your cooling EasyPress on some of the empty spaces on the velvet. The tepid heat will help add gorgeous light-catching shimmers on this luxurious fabric! 11. Finally slide through your suede cord, tie, and admire! It's time to propose! Love this tutorial? You have to see the entire styled shoot inspiration for a Thanksgiving-inspired proposal! 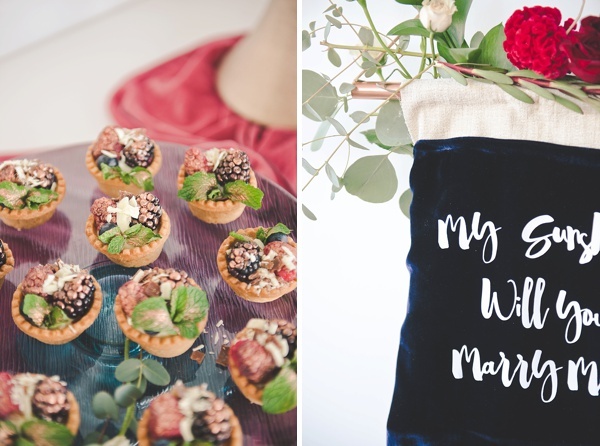 Decked out in sweet treats, geometric loveliness, and velvet galore, it's a must see! Beyond the banner, make your marriage proposal even more memorable by involving friends and family for a meal together. Food always brings people together in the best sort of ways! 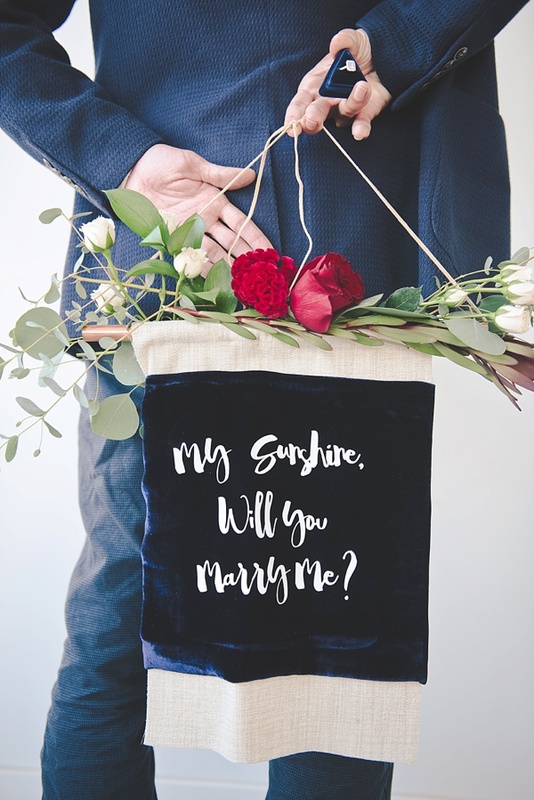 You can still add the element of surprise by creating the storyline of celebrating your relationship at your favorite restaurant or venue that allows you to bring in your favorite caterer. 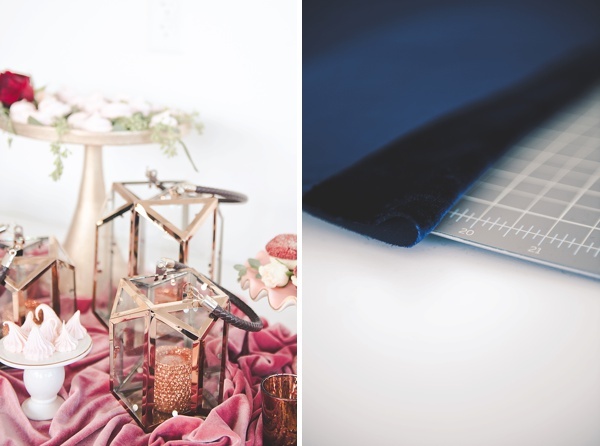 If planning isn't your thing, enlist a local wedding coordinator to help tie all the logistics together. For pretty and practical, keep your dinner table personal by asking a local florist to put together a small low-lying floral centerpiece of your sweetie's favorite blooms or colors. If you don't already have sentimental decorations you'd like to include, contact a local specialty rentals company to help with some decor ideas for the table or room. We will always be suckers for flowers and specialty rentals since it takes the everyday into the special day perfectly! Need some visuals? 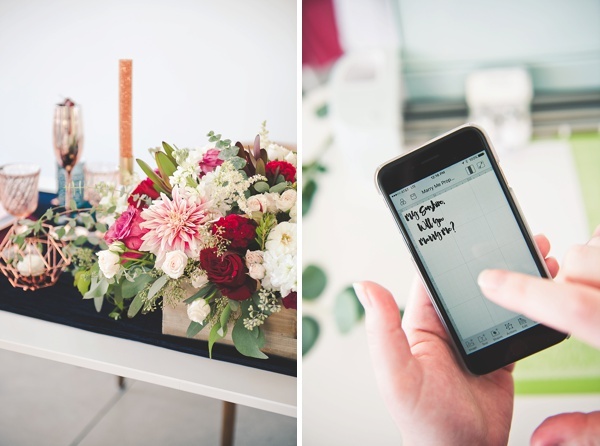 Head over to our Thanksgiving-inspired marriage proposal styled shoot feature! 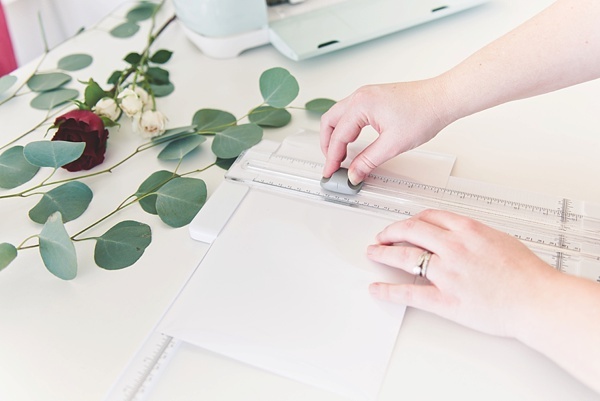 Many thanks to Cricut for partnering with Tidewater and Tulle for this DIY tutorial feature! And while the disclaimer is that we were sponsored through compensation to write and design this, the words and our loyal love for the Cricut brand are all our own. Some of the above product links are affiliate-linked and purchasing through these links helps support our wonderful sponsors and Tidewater and Tulle! You can find our full affiliate disclosure policy here. Shop Our Curated "I'm getting married!" Celebration Favorites!